Damn, Daniel! MSI is back at it again! 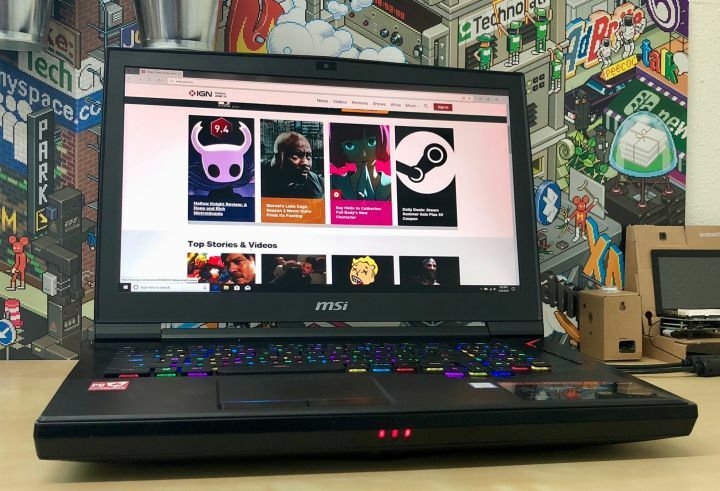 By that I mean it’s back to making laptops that are absolutely gargantuan in size, and this time it’s the GT75 Titan 8RG (See it on Amazon), a gaming laptop that will break your bank account, frame rate expectations, and your back if you ever try to take it on the road. Like the previous Titan I reviewed, this XXL-sized laptop is so monstrous, it requires two power supplies. In fact, its dual power supplies probably weigh about the same as your typical laptop, so when I say this thing is big, it’s actually an understatement. Unlike the previous MSI mega laptop that I reviewed, this time around the power-hungry culprit isn’t dual GPUs, but instead it’s Intel’s new Coffee Lake Core i9 processor. This is the first laptop to sport this beefy processor (that I’ve reviewed), and it’s a six-core beast that’s fully unlocked for overclocking, with the ability to run a single core at the insane clock speed (for a laptop) of 4.8GHz. The CPU along with the rest of its high-end parts mean this is basically a desktop, but with a built-in display. The only thing missing from the spec sheet of the GT75 is a 4K display. Adding that feature to the equation will set you back and extra $500 over the 1080p version I tested, which is priced at $3,999. If you’re suffering from sticker shock MSI also offers this model with either dual GTX 1070s, or a single 1070, but they’re hard to find. Let’s get it out of the way: This laptop is big. REALLY big. It weighs over 10 pounds and measures 16.85 x 12.36 x 2.28-inches. Though I’m used to laptops that are this wide and tall, its thickness took some getting used to. At 2.28-inches thick, resting my forearms on the keyboard was uncomfortable at times since the chassis is over two inches tall. As a full-sized laptop, the GT75 is unsurprisingly loaded with expansion ports. The left side of the housing is home to four audio ports (line in/out, audio in/out) and three USB 3.1 ports. On the backside, you’ll find the Ethernet port, a miniDisplay Port, a USB-C port with Thunderbolt, an HDMI port, and the charging port. By adding Thunderbolt support to the USB-C port, you can connect an external monitor or an external hard drive and take advantage of Thunderbolt transfer speeds. Finally, the right side of the GT75 is where you’ll find two more USB 3.1 ports and an SD card reader. With this many ports, you’re more likely to run out of stuff to plug in before you run out of ports. Upon opening the lid, a 17.3-inch HD display with a 120Hz refresh rate and Nvidia’s G-Sync technology greet you. It’s a big screen that’s easy to get lost in, especially when gaming. Even with thick bezels surrounding it, the screen feels immersive due to its size (on a laptop, at least). Unlike last year’s model which had a touchpad to the right of the keyboard, the GT75’s touchpad has thankfully moved back to the traditional spot below the keyboard. Two physical buttons, each with its own RGB light, provide a firm click and eliminate the need to fuss with two-finger taps or presses. The keyboard is a SteelSeries Rapid RGB Keyboard with MSI’s mechanical switches. Each key has an RGB backlight that’s controlled by SteelSeries Engine 3 software (more on this in the software section). As with any mechanical keyboard, the clickety-clack of the GT75’s keyboard registers a loud and a reassuring sound for each key press. Most laptops can’t actually fit a mechanical mechanism into the chassis since there’s not enough room for it to move up and down properly, but that’s obviously not an issue with this model, so one of the benefits of a laptop this size is you get a full-blown mechanical keyboard, which is rare in a laptop. To the right of the number pad, there’s a series of “quick launch” buttons that are labeled, but instead of putting a sticker or silk screening on the housing, MSI engraved an icon for each button making them almost impossible to read. One button changes keyboard lighting profiles, another controls fan speeds, another launches MSI Dragon Center, and finally, there’s a dedicated button for XSplit Gamecaster. Based on looks alone, the Titan GT75 is an intimidating machine. It’s big, bulky, and — at times — awkward to use. But it’s what on the inside that counts for this machine. Powering the GT75 is a Coffee Lake Intel Core i9 CPU, 16GB of memory, a 512GB NVME SSD, 1TB HDD, and a Nvidia GTX 1080 GPU. As you can see below, there’s some rather extravagant cooling required for the CPU as it has a total of six copper heat pipes. There are two empty RAM slots and you should be able to access the 2.5″ hard drive bay as well, but as far as I can tell that’s it for upgrades. Overall this is pretty standard for most high-end laptops; RAM and storage (along with Wi-Fi) are usually the only upgradeable components. There are a few different programs preinstalled on the GT75. The most annoying of which is Norton Antivirus. That’s right, MSI decided it was OK to install Norton on a laptop that costs $4,000, but then again MSI has always been known to install bloatware on its laptops. Outside of Norton, there are a few programs that are useful. My favorite of the group is SteelSeries Engine 3. Its intuitive design makes it incredibly easy to change the lighting scheme of the keyboard with just a few clicks. Preinstalled profiles, like the American Flag, are just a few clicks away. Perhaps my favorite part, however, is the app’s ability to scan for installed games and automatically switch to a lighting profile dedicated to that game. A quick scan of my review unit found and created profiles for Far Cry 5, PUBG, and Fortnite. But instead of having to remember to switch between profiles when switching games, the program automatically switches on its own. And when I quit a game, it goes back to whatever profile I was using. It’s really slick the way it’s handled, and I appreciate the sophisticated implementation. As I mentioned previously, MSI has relocated the touchpad from the right-side to the traditional spot on this model. Though I find it much more usable now, I did experience a lot of accidental taps with my palm while gaming. Thankfully there’s a quick keyboard shortcut (Fn+F3) to disable it. Most of my time with the GT75 was spent with the touchpad disabled for that reason. Another program, MSI Dragon Center, is the GT75’s command center for checking on and tweaking your system. The program includes options to change the power mode, free up memory, and change system profiles to allow for even better performance or slow things down a bit if you don’t want to push the laptop too hard (or make too much noise). I peaked at my system stats a few times during my review time but never spent a lot of time in Dragon Center. That’s not to say it isn’t useful, I just had no need for it during my short time with the laptop. Outside of Norton Antivirus, the software on the MSI GT75 doesn’t get in the way and isn’t overbearing, adding to the overall experience on this pricey laptop. With an all-star component lineup, I expected a lot from the GT75, and I was not disappointed. The benchmarks are impressive in their own right, but my experience in Fortnite and PlayUnknown’s Battleground was a consistent 110 to 120 frames per second. That’s with both games set to Ultra (or Epic). With its 120Hz display and 120 fps in most games, this was by far the smoothest gaming machine I’ve ever used, and I’ve reviewed every high-end laptop on the market for the past few years. For the first couple of hours playing on the GT75, I had an almost queasy feeling. Weird, I know. Eventually, the feeling went away, and I found myself trying to excuse the size of the GT75 with the rationale that a user could use an external keyboard to make up for the awkward height of the one that is built-in. I wish every laptop was this fast and smooth for gaming. Comparing benchmarks with other GTX 1080-equipped laptops, the GT75 showed just how powerful it is. Looking through the benchmarks, the GT75 was close to last year’s MSI Titan with its dual GTX 1080s in SLI. Since most of IGN’s benchmarks are games however, there’s no beating an SLI setup. I didn’t have any other systems with a Coffee Lake CPU to compare it to, as this is the first one I’ve been able to get my hands on for testing. My loudest gripe (pun intended) about the GT75 is how loud the fans are. I always try to test a laptop without headphones at first to test the speakers and gauge how they sound. With the GT75, after a single match of PUBG, I had given up on that. I usually can deal with not being able to hear footsteps of approaching players, but even at full volume, I had a hard time trying to determine when I was being shot at. This is the type of laptop you want to connect a display, keyboard and mouse to and just keep at the back of your desk if you can. I wish every laptop was this fast and smooth for gaming. Also, there’s been a lot of controversy surrounding this particular CPU as it’s the first Core i9 chip for laptops, and with a maximum single-core clock speed of 4.8GHz, it’s a tall order to keep it cool. Apple made headlines recently by wedging it into its Macbook Pro chassis, where it was reported to experience severe thermal throttling. This means the CPU runs too hot (due to inadequate cooling), so its clock speeds are lowered, resulting in diminished performance. I ran Intel’s Extreme Tuning Utility on it, which has a notification for thermal throttling (as well as power throttling), and am happy to report though it did throttle itself it wasn’t until it hit 4.4GHz. That’s not quite 4.8GHz the chip is rated for, but it seems as if it’s by design as MSI has the multiplier set at 44 in stock trim. Overall, that’s not too shabby. Battery life is something last year’s Titan failed to deliver on, not even registering an hour worth of use away from a power outlet. Since this system only has one GPU, however, I expected better performance and was not disappointed. With the GT75, I was able to squeeze 90 minutes of life out of the battery performing a 4k video rundown test. That may not seem like a lot, considering most gaming laptops that come across my desk routinely reach over 120 minutes of use — but all things considered, its a decent score considering the hardware contained within. The MSI GT75 Titan 8RG has an MSRP of $3,899 and is available for the same price on Amazon. There’s several configurations available though, but pay attention to the specs as none of the other models listed have the same Core i9 CPU as my test system. The GT75 Titan is a screaming laptop that delivers in real-world performance. It’s pricey, and is about as portable as a PC tower, with the bonus of a display. If you’re looking for one of the most powerful systems around and the price isn’t an issue, the GT75 is about as future proof as a laptop can get right now.